Dynamite Entertainment will release Xena #1 on February 14, 2018. The first issue of this reboot series opens with a beautiful young bard being captured by a band of ruffians, who though they are able to overpower the young woman, make it clear early on that they are no match for her wit and intelligence. Toward the middle of the issue, we are finally introduced to our heroine, Xena, looking like the strong, magnificent warrior princess we have known and loved for decades. There is very little to discuss when it comes to the writing or the plot of issue one. Although I have no major complaints about the dialogue within the story, I also can’t really pinpoint anything outstanding about it either. The first issue of a series should grab your attention and leave you needing more, anticipating just what will happen next and unfortunately I found this first issue somewhat lackluster. When you are given such an iconic character to write about, such as Xena, one would hope that you have lofty aspirations of creating a story worthy of the character, and so far with this issue, I found Meredith Finch’s writing style to be a bit bland. 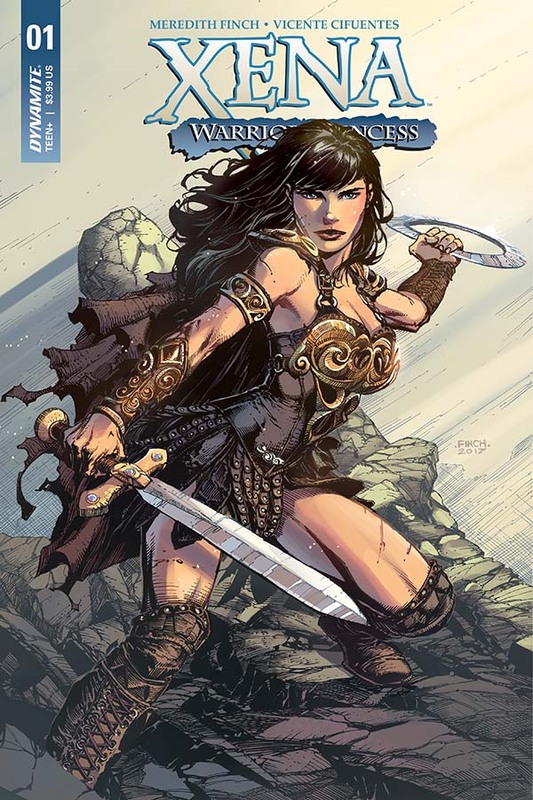 In a story that should be exciting, vibrant and full of adventure, issue one of Xena consists mainly of quippy back and forth dialogue from characters who do little to grab one’s attention. The art, done by Vicente Cifuentes, known for his work on numerous popular DC titles, certainly is the saving grace of this book. His lines are crisp and clean and the background scenery is lush and full of life. I have a profound respect and appreciation for Cifuentes’ work, and he doesn’t disappoint in Xena issue one. There is a great level of detail provided to each character, all who are drawn in a way that the book has a very high fantasy quality to it. There is a wonderful amount of expressiveness in the features and gestures of the characters throughout this issue, which certainly assists in making it a more enjoyable read, as the dialogue lacks the level of characterization that the art brings. Although I wasn’t blown away by issue one of Xena, it would be remiss of me to say that it offers no potential. First issues of any comic, especially a reboot of a renowned character, can be extremely daunting, and though it certainly wasn’t something I felt much of a connection with, I believe it could just be the lack of detail or plot outline that eventually will be addressed in future issues. Dynamite’s Xena certainly isn’t a write off for me, as it is a character that I love and have high expectations for. I will certainly be interested in seeing the continuation of the series and hope that the plot and characters become livelier with time.